Windows users have several options at hand when their system does not boot anymore. They can try to boot into Safe Mode, use System Restore to recovery the system to a previous state, or use repair options on the Windows CD to repair the issue. When Windows 8 gets released, options get even better with the included reset and refresh options. Sometimes though you may need something more powerful, for instance if you need to correct partitioning errors or recover files from a failing hard drive. 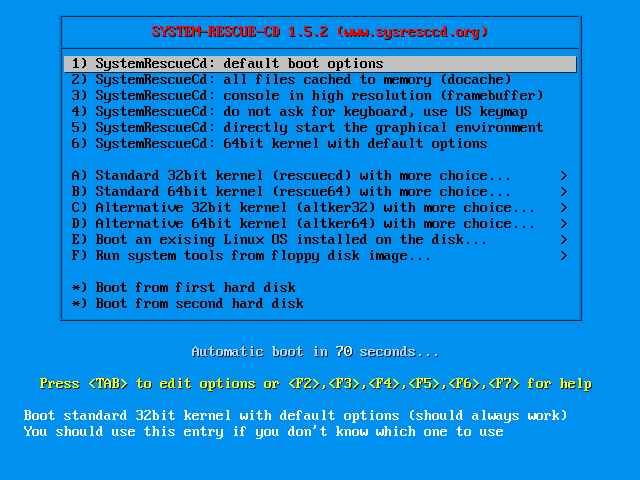 System Rescue CD is a Linux Live CD that has been specifically designed for repair and rescue operations. You should not get too confused with the CD in the application’s name though, as you can also install the contents on an USB stick instead which is handy for PCs that do not come with an optical drive anymore (See this manual page for the Windows installer link, and Linux console commands to create the USB version of the rescue disc). 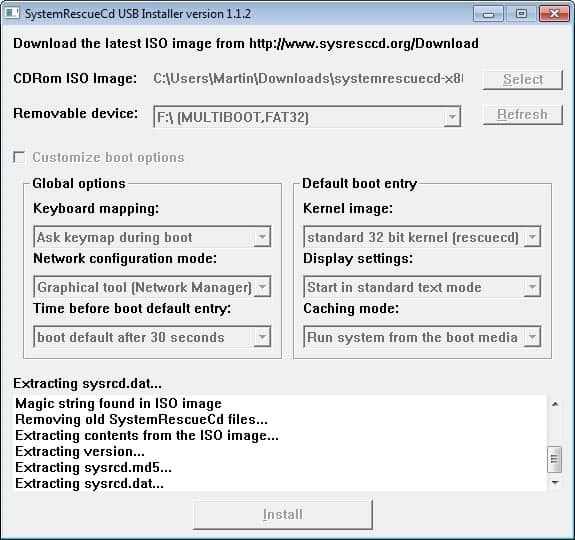 Everyone else can download System Rescue CD as an iso image from the project website. When you first boot either from the rescue CD or USB drive, you get to see the following boot menu. A tap on the enter key loads the system with the default boot options. Znless you have selected different settings during creation, the CD will load the console if you select the default options. You can type wizard and select a graphical user interface to boot into an interface that should be more pleasing to the average user. Linux buffs on the other hand who feel at home using the console can use it for all recovery and repair options. From here, you can start programs like the file explorer Midnight Commander, the partitioning tool Gparted, the data recovery tool Testdisk, a CD and DVD burner, or the antivirus software Clam. You also get access to a web browser or mail reader, in case you need to look up information on the Internet. System Rescue CD is one of those useful-to-have tools when disaster strikes. It is best used in situations where standard recovery options fail, especially after hard drive crashes and other emergencies. You can check out the related articles and tags below for a selection of alternative solutions. While we are at it, which recovery solution would you recommend?